Little Red Gliding Hood is a fractured fairy tale lover’s dream story. I counted seventeen different fairy tales/nursery rhymes mentioned in Little Red’s newest story. Poor Little Red Gliding Hood, her skates are so worn she may not be able to skate to Grandma’s on Sunday. A skating competition is offering a pair of golden skates as first prize, but Little Red needs a partner. It seems every fairy tale partner, from Hansel and Gretel to Jack Sprat and his wife, are paired up. What is Little Red going to do? She needs a partner in order to win those golden skates. Enter . . .
Did you guess who Little Red’s skating partner is? Yep, the one and only scary Wolf. The same wolf that wants to eat Grandma and huffs and puffs then blows down the Pig’s house. 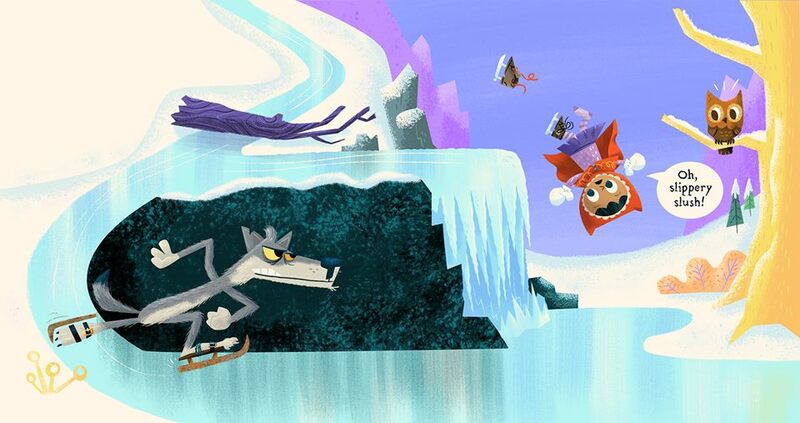 After a chase, a fateful fall, and a grand catch by the Wolf, Little Red is safe and has herself a skating partner. 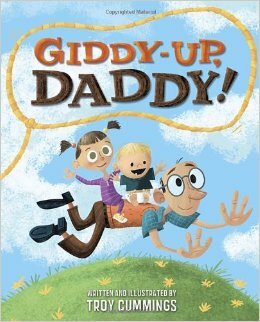 What happens next will have you and your children rolling on the floor with laughter—belly laughs, to be precise. 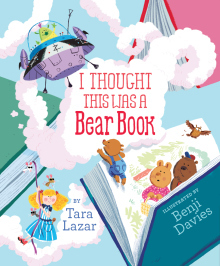 Little Red Gliding Hood is hilarious, as every fairy tale or nursery rhyme character Lazar could think of finds its way into her story. Cummings’ illustrations are nothing short of beautiful, full of fairy dust fun, and as expressive as Little Miss Muffet can get when confronted with a Wolf on skates. The action is non-stop, the tales skillfully fractured, and Little Red will be able to go to Sunday dinner at Grandma’s for some time to come. 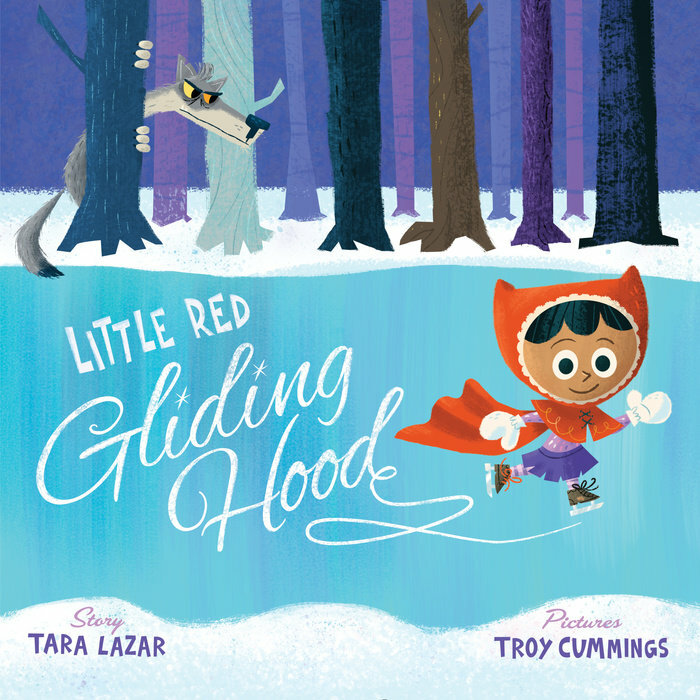 Little Red Gliding Hood shows how far Lazar’s writing has improved since her wonderfully creative debut The Monstore (reviewed here), appeared on store shelves. Lazar is sharp, witty, and knows how to entertain children. Her next book, Normal Norman (coming March 2016), should be another hit. I’ll try to bring to Kid Lit. 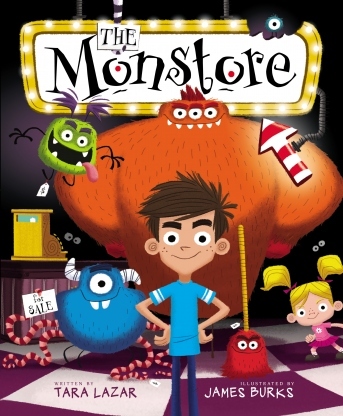 Note: Love picture books and want to write one? 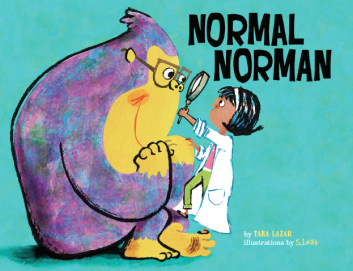 Then join Tara Lazar’s Picture Book Idea Month (PiBoidMo) this November. Registration usually begins in late October. See you there! LITTLE RED GLIDING HOOD. Text copyright © 2015 by Tara Lazar. Illustrations copyright © by Troy Cummings. 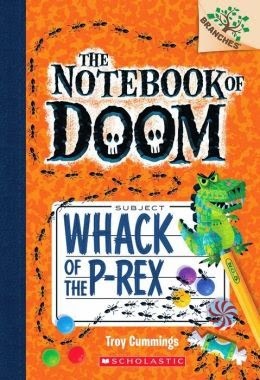 Reproduced by permission of the publisher, Random House Children’s Books, New York, NY. Purchase Little Red Gliding Hood at Amazon —Book Depository—IndieBound Books—Random House. Learn more about Little Red Gliding Hood HERE. . . Random House Children’s Books is a division of Penguin Random House. I love Little Red Gliding Hood from the moment I opened the book. The artwork is fantastic, but the story is nothing short of brilliant. Woo-hoo! 6 stars! Yay, Tara! I can’t wait to get my paws on this one after reading your super duper review. We love Tara’s humor. She is wildly talented. I cannot wait for this book!!! Great review! Thanks, Penny. It is a gorgeous book and quite funny. I cannot imagine fracturing 17 fairy tales & nursery rhymes for one story. Amazing!